Still, I made progress. I need to make the bases pop more, so they need one more go at to brighten the corners of the tiles. 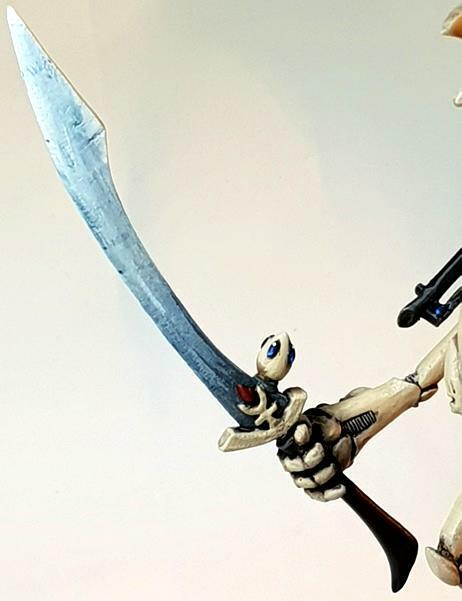 The guardians all have blue helms and one layer of bleached bone/rakarth flesh since these pics were taken. They still need a final bone layer. 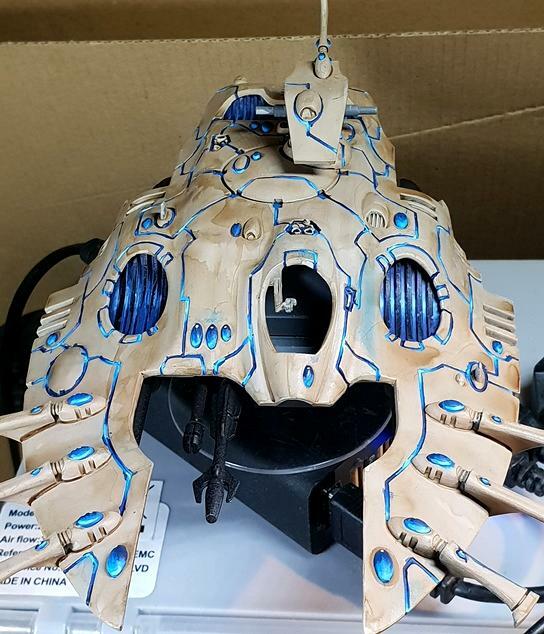 They need their helms all layering up to the brightest blue and their eyes done. 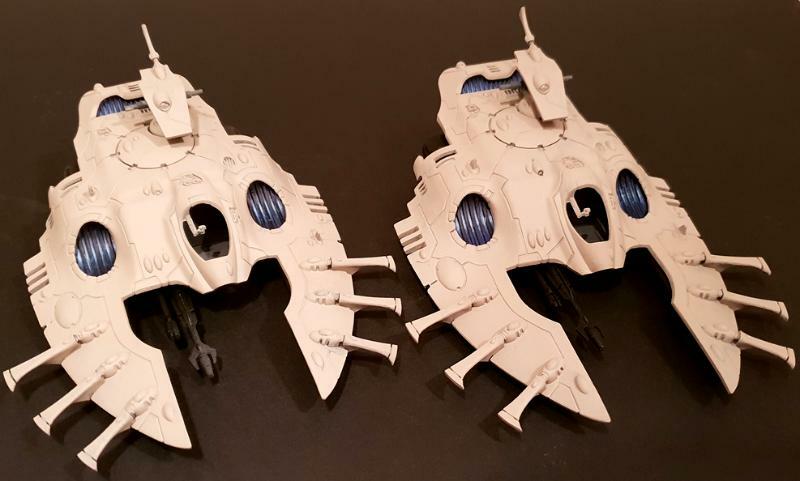 The eyes are done with light grey and white, followed by a yellow wash. All of them still need their weapons done. The rangers will have a blue and grey camo pattern on the coats. 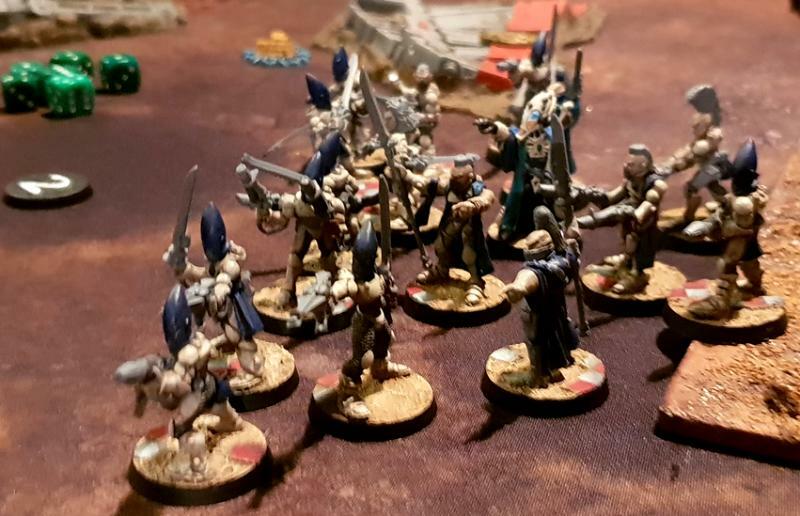 My first of three battles saw my army fight alongside a more modern Iyanden force. 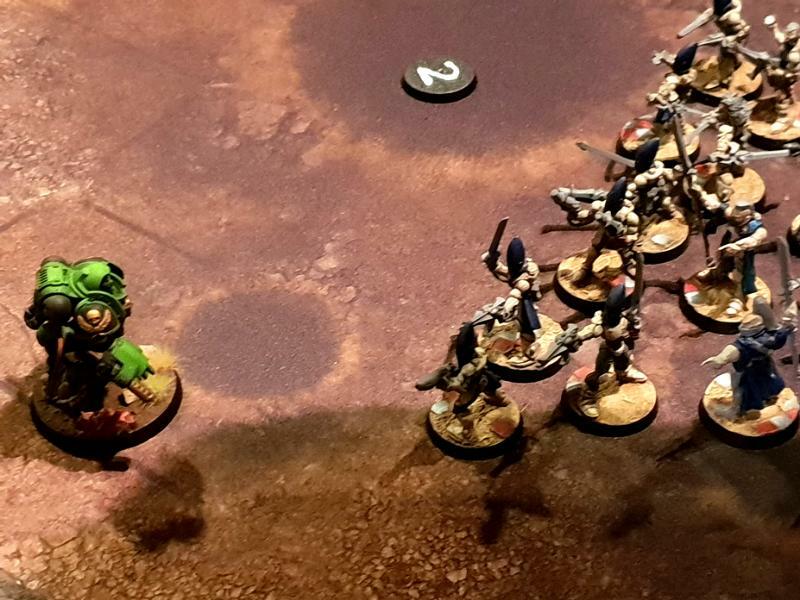 We secured a 12-7 victory point in a game against Sisters of Silence, Custodes and Marines. We had to catch and keep some enemy agents who kept trying to escape off in random directions. 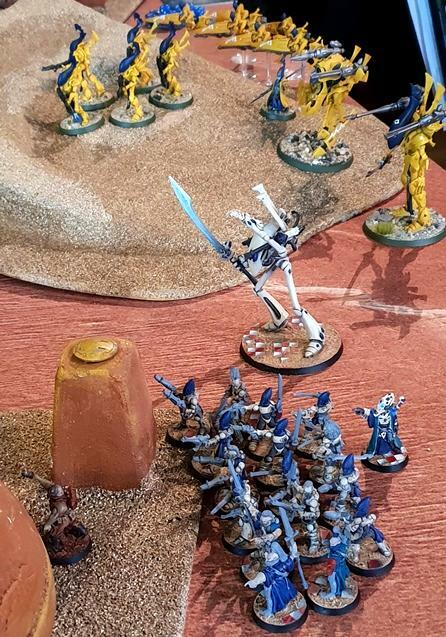 Despite forgetting to move my Wraithguard in one game, we managed to hold on to our own agents, claim one from the enemy and kill the squad holding the other. 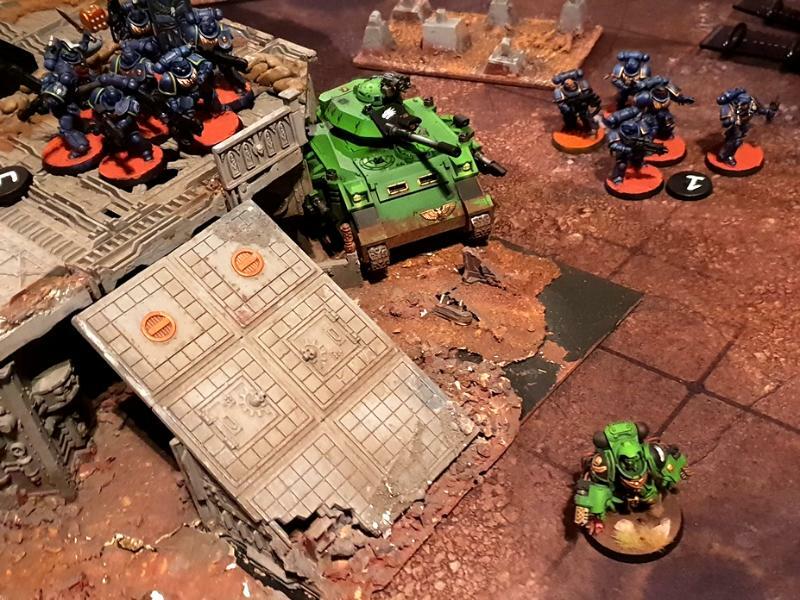 Second game was alongside Carcharadons Astra, or Space Sharks, if you will. I could only get victory points by claimign objectives, and he could only get victory points by eliminating squads. We ignored the Death Guard, mostly, and almost wiped out the Emperor's Children for another win. That was despite me accidentally killing a Dreadnought, Chaos Lord and squad of Noise Marines! 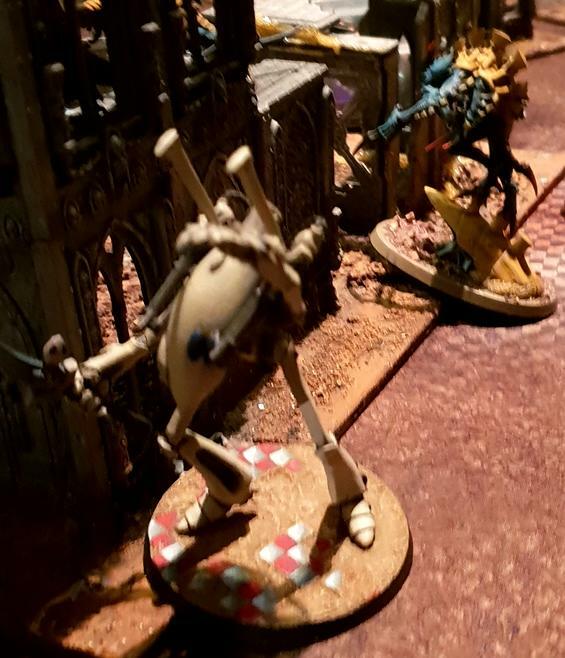 My Wraithlord became best buds with the Redemptor. The last game was Maelstrom-extreme. We rolled five dice to see which of six objectives we needed to claim. Doubles, trebles, quads and quins had special rules! 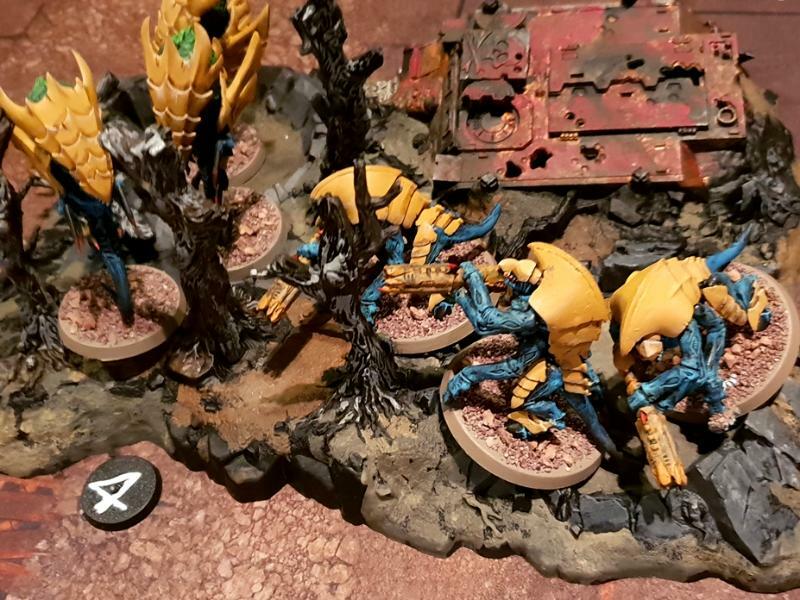 The vagaries of the pairing system this time left me with a Tyranid partner, up against two Primaris armies! My Storm Guardians had done nothing but sit on objectives in my previous two games, so whilst effective were hardly invovled. 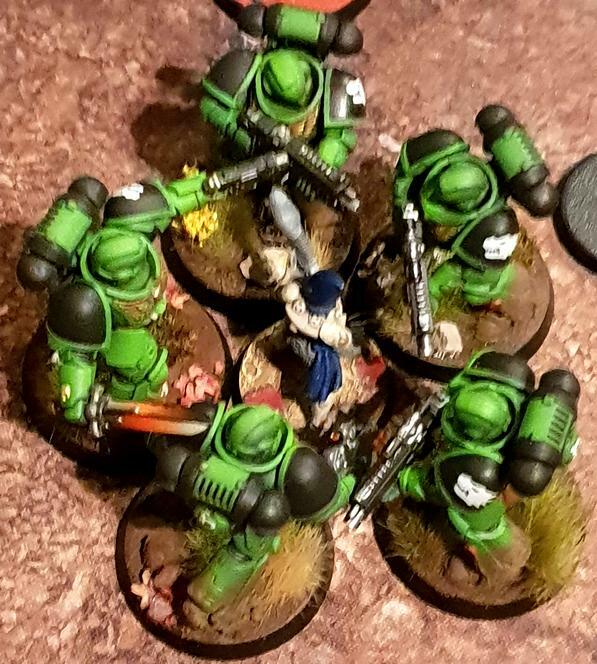 In this game, a squad of sixteen Storm Guardians protected with Celestial Shield and Fortune weathered two turns of shooting from almost every Primaris squad to pick up lots of VPs and finally had to be attacked by five Primaris in combat all at once to be finished off. Talk about overkill! The squad of eight sat further back but did similarly well, later in the game. 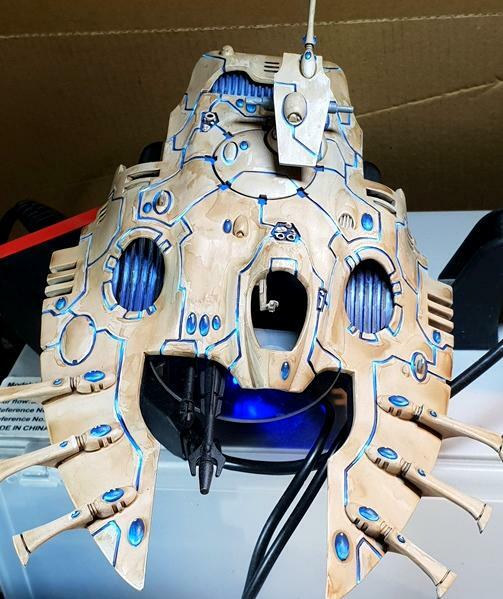 For once my Wraithlord underachieved, as it was blown apart by pesky hellblasters. I am pleased with how they are turning out. Also pleased to be on page 10 I'll catch up with you soon, Gits. Love your blog man... very inspiring. Nice report. Good to see the lead out on the field. Just beautiful! Excellent conversion and great job on the gems! Beautiful , that guy deserves a high 5! 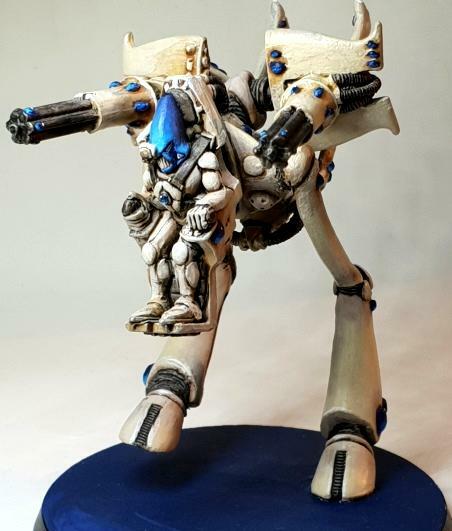 Gorgeous looking Wraithlord, love the base too! 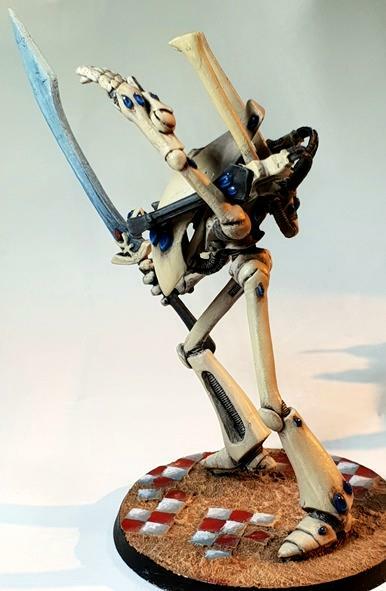 I also took a decent photo of my War Walker. 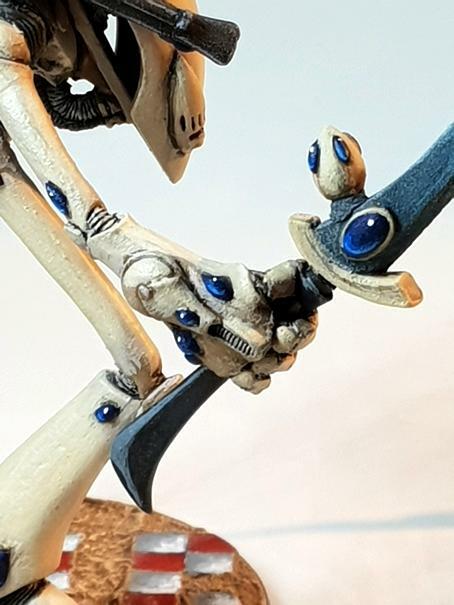 This was the very first model I painted in this scheme, and since I painted it, I ran out of the very original Bleached Bone. The second version, and the type now in the Cote d'Arms range is slightly warmer and richer, so I now mix with Bleached Bone Ushabti Bone and White to get my final layer. I still think they look fine alongside each other though. Sweet looking squad! I like the blend of blues you've used on their helmets. 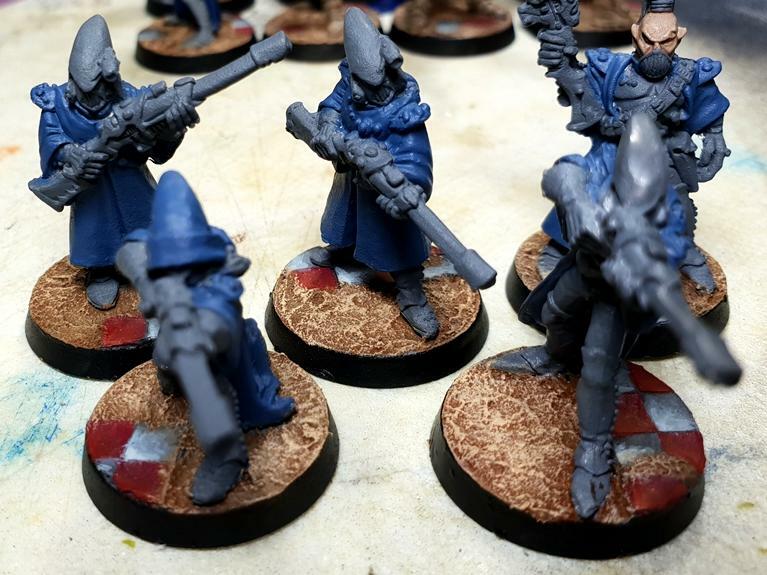 I've a few guardians in need of assembling and the release of CA has me tempted to make a Storm squad with the Avatar to make a fearless bubble of dudes. Definitely worth trying them out in a few games at least. Can't have enough flat-tops and mohawks. Beautiful squad, man. Classic metal guardians take me right back to the early 90s and my first opponent. 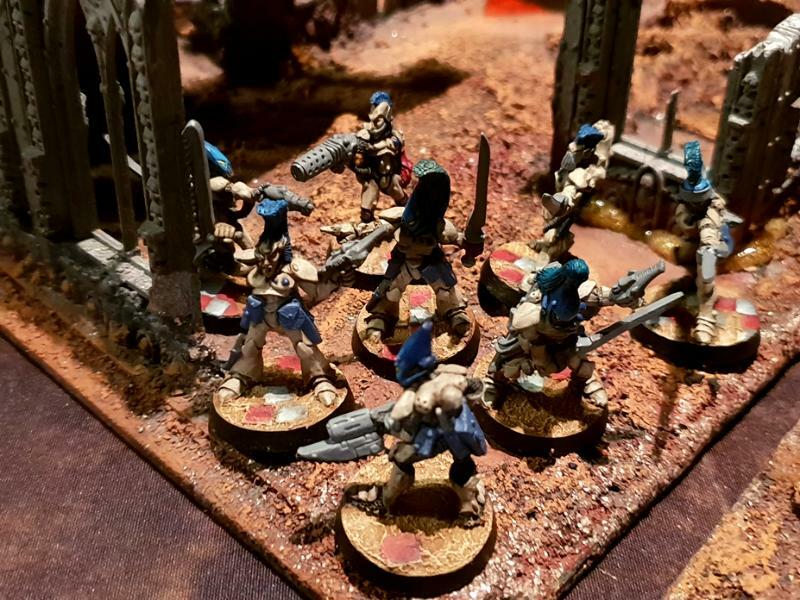 Happy days indeed, lovely stuff, beautiful paintjobs too. I have found Storm Guardians surprisingly useul. Don't expect much out of them in combat though, even with their chainswords and pistols! My favourite use for them is to either have them objective sit or deploy them aggressively to use Fusion Guns. When objective sitting, you won't get to shoot as they have sod all range, but they are cheap and slightly less helpless if they get charged. If anything, people are more likely to ignore them if they lack heavy weapons, even if they are scoring VPs. If deployed aggressively, a squad of 16 can be extremely durable with the right stratagems and runes. I play Iyanden, so morale losses are not really a concern. Yeah, I love the hair on these guys! Weirdly, although I started in 40k 1990, I never had these models. 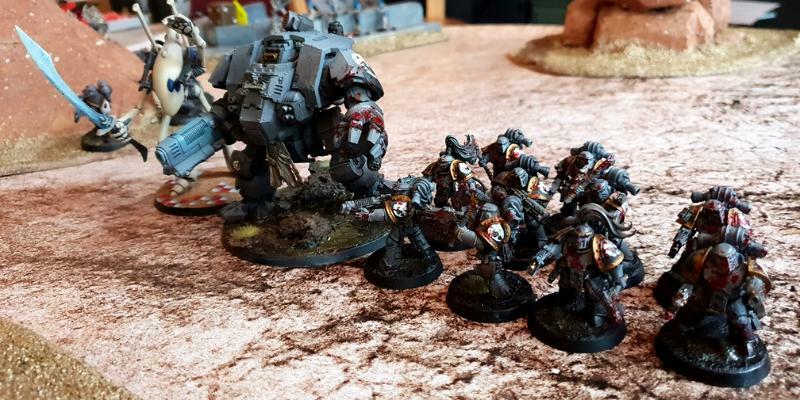 I started with Orks, and them dived straight into the Jes Goodwin Aspect Warriors. 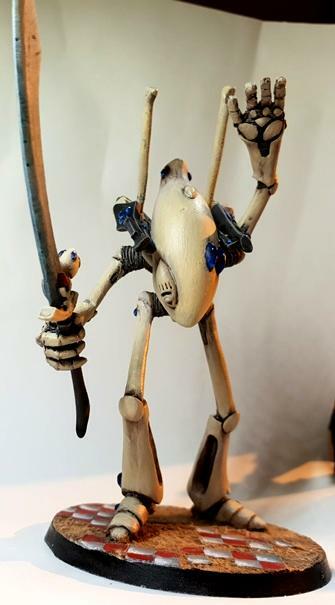 Very stabby! 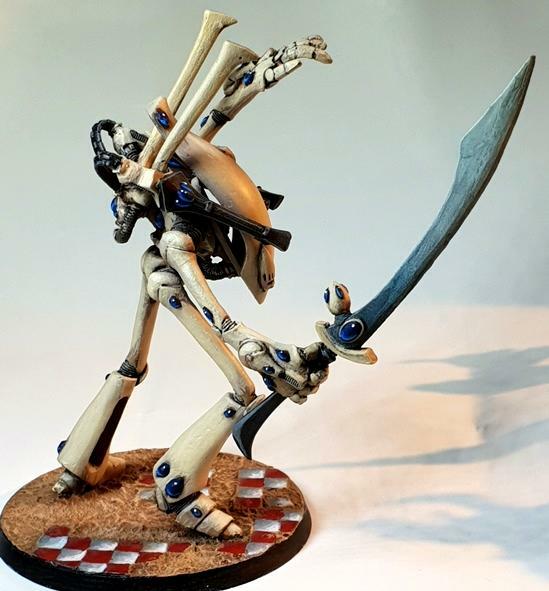 Though I find it absurd that chainswords and Aeldari blades cost the same (0 points) but Aeldari blades are less effective. In a good way, I hope! Some classics in that squad - the bionic eye/chainsword and the hachimaki headband guy in particular. 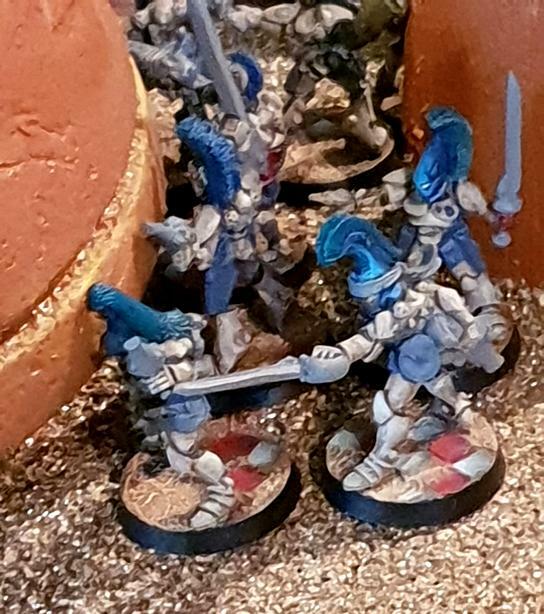 Only had a couple of these guys as I was far more interested in chaos back then, so knowledge is a little ropy - but is the last guy on the right in the second group an actual guardian that they then based the striking scorpions off, or was he an early iteration of an aspect warrior? 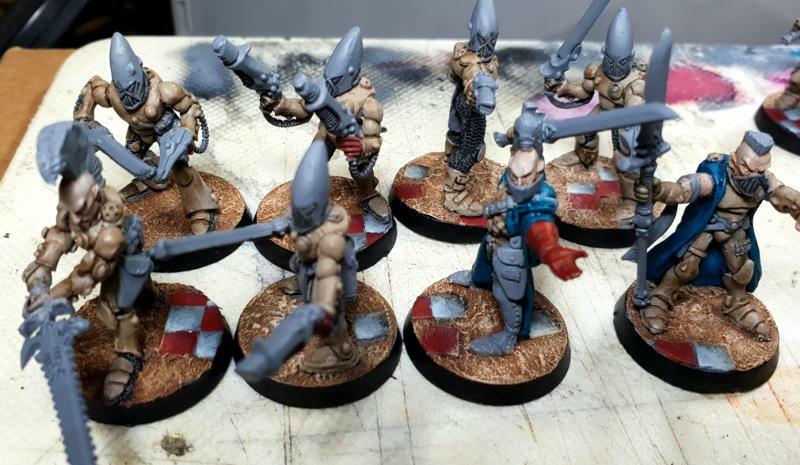 As I remember it, Jes Goodwin designed a load of Eldar Guardians, then went on a holiday to Egypt where he was inspired to design five models which are now regarded as proto-Avengers. They look to me like the inspiration for both Avengers and Scorpions. 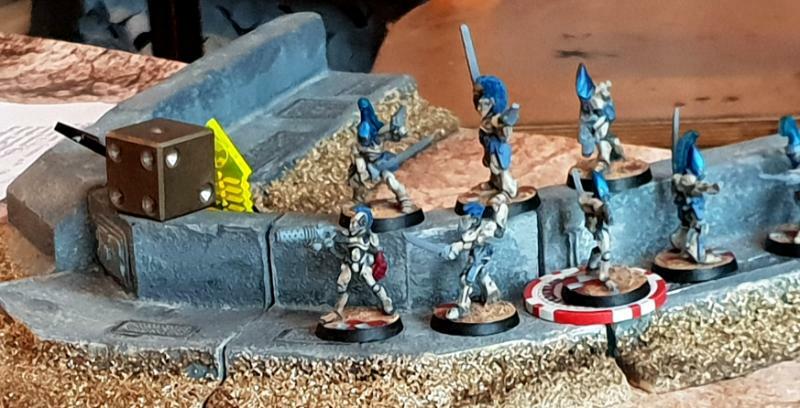 There are some callbacks to other models from earlier in the range too, such as the top left of my guys with the chainsword. So, a long time ago, I posted this image of a Falcon I have never finished. 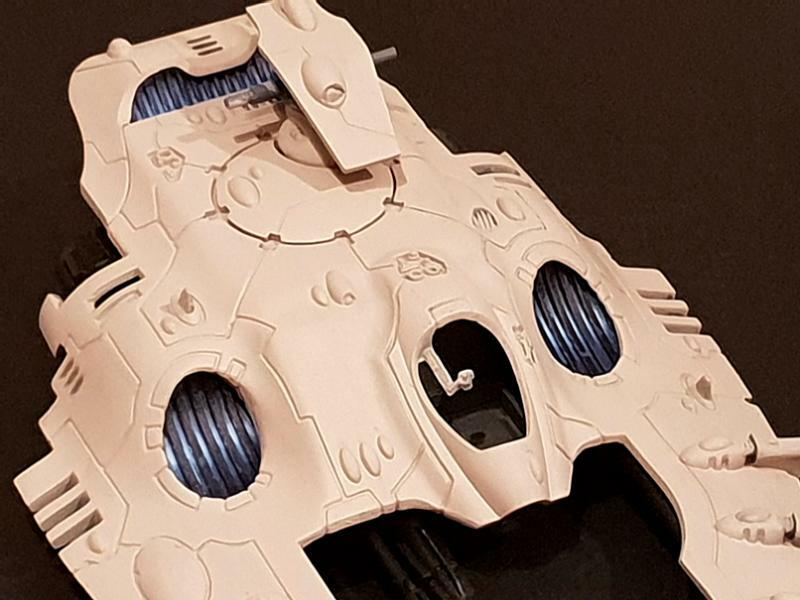 The Falcon is painted in the colours of the Bloody Hands of Khaine, but it serves as an introduction to the colour scheme for the Eldar vehicles in my Ynn-Bydos army. These fellas are for Phase 3 of my 40k Ascension army. I'll be working on them over Christmas. They will have the same type of recess colouring as the Falcon, but done from dark blue to light blue. Tomorrow's job will be to wash the whole thing in soft tone, or the old GW sepia tone. Made some progress. I've got the blue blended in. I have not done it anywhere near as carefully nor used layers anywhere near as diluted as I did the lava Falcon, as I simply don't have the time. I now need to go over lots of the bone. I knew I would need to, but I was more careless than I should have been. 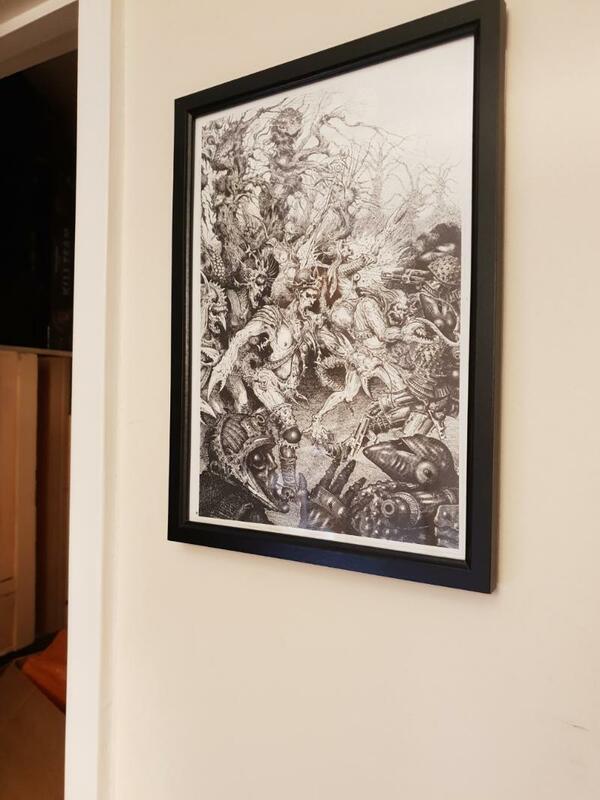 I also finally got around to hanging something on my wall. This is a genuine page from my spare, falling-apart Slaves to Darkness that I framed. I plan to do this with lots of pages. Those tanks are gonna look sweet! And big respect for framing a page from one of the greatest books GW ever made. Great progress on those tanks! Love the panel lining you've done on both and the bone colour is looking good! 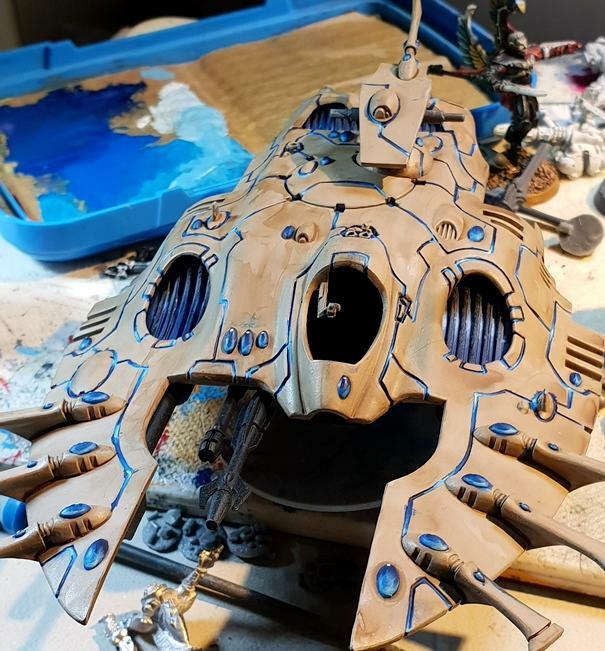 Some decent progress on the vehicles. Tiny bit of progress. I just tidied up the mucky blue paint and rewashed. 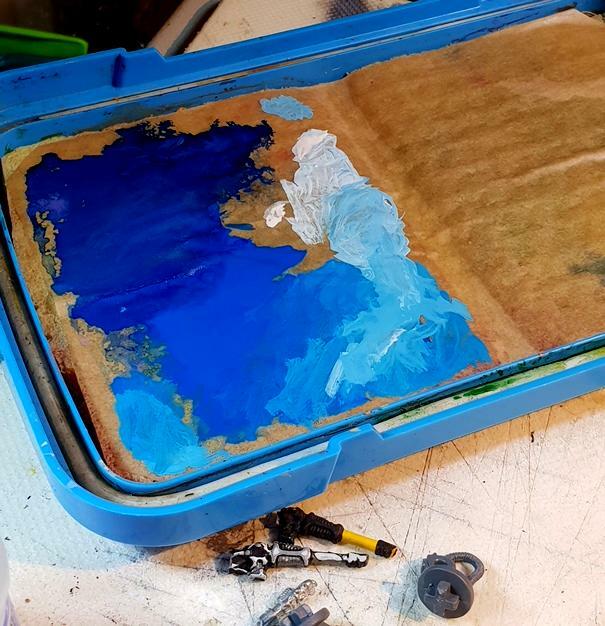 It looks messy as hell, but there are at least two layers before it counts as finished anyway, so it won't be a problem. I love the lighting effects Fifty. Nice! Nice work on the blue, and a quality piece worth framing that is.